Not sure which robot suits your needs? Check out our user guides to learn more about the features and benefits of our different robots. You can also download the PDF guides and save them for later. 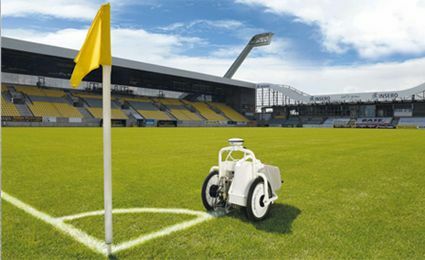 Our company specializes in high-precision, reliable outdoor robots that perform marking and stake out. 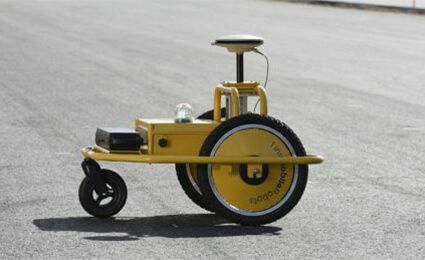 Our robotics engineers combine advanced robotics software with artificial intelligence and high-precision technologies from the land surveying industry. To ensure reliable and robust technology, we also incorporate proven technologies from other industries. Our aim is always to turn the scientific and technological evolution into meaningful solutions for our customers. We are dedicated to improving the way our customers work and how they use automation and positioning technology in their day-to-day work. That is why we exist. Different technologies enable different outcomes. It is the combination of these technologies that give our robots their potential. To get the best results, we use probabilistic filters and real-time kinematic to increase the accuracy of our robots. We design user-friendly apps that allow anyone to work with the robot. Teaching colleagues how to use the robot is also very easy. All of our user interfaces have been tested for usability by world standard methods to make them as intuitive as possible. The specific layout dimensions can be adjusted on-site with the control app. 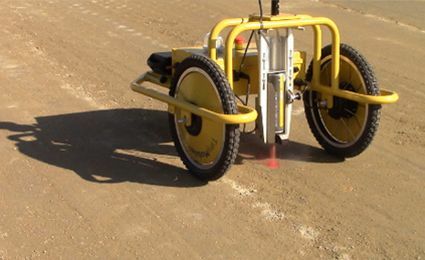 A football field can be resized seconds before marking begins. The robots batteries will work up to 8 hours on one charge. The batteries are easily replaced on the go, allowing the robot to continue working. Mobile robotics are changing the way people work. We strive to make our autonomous robots a valuable addition to way our customers work. Our spray tool supports all standard-sized aerosol cans, allowing our customers to use the same cans as before. Accuracy and precision are enhanced by the robots’ built-in support for marking lines and arcs. We would love to stay in touch by email. We offer video interviews, user guides, customer stories, product updates and more.